Looking back through the Assignment work, selecting what to send to my tutor, I am happy with what I have achieved. I can already see progress and improvement in my work and I’m excited about the path ahead. I can see that the course is introducing and building on concepts in a measured way and it’s just this kind of structure that I was looking for in my learning. One constant has been feeling the need to keep moving and to jump! even when there was more that I wanted to do. That has continued during the (literal) wrap-up of this Assignment, which has taken longer than I wanted or expected and even so is not as considered or complete as I would like. From being unsure about the meaning of “mark-making” I have become much more aware of the marks and textures I see around me. I am continuing to grow in confidence in using a range of media in my sketchbook, although the daily discipline has slipped a little while focusing on assignment work. While every aspect would benefit from continued practice, I would like to push myself to use collage more. Stitching has not been a major focus for me in the past. Once I loosened up I found it more engaging and enjoyable than I expected. I was pleased with some of the work, particularly the stage 3 sample. Stage 6 was very difficult largely because I felt I hadn’t been challenging and pushing myself enough earlier. It was a valuable experience – I feel I learnt a lot, partly about stitching but more about taking risks and letting go of control. I haven’t completed the research points of reviewing textile exhibitions. I expect to have opportunities to do this in the next few weeks. Working on the assignment has allowed me to reconsider my level of knowledge and expertise in textiles. I tend to see myself as generally inexperienced, a latecomer to the field. However I’ve found I know at least a little about quite a lot, and I think it would be useful to recognise and value my experience more. The assignment has also led me to review my general work methods and time management. My work area has become more organised over the past couple of months. I have always kept work notes and reflected on progress and outcomes of my various projects, and those habits are adapting to the new requirements. I’m going to try reading ahead more carefully to see if that improves my understanding of the requirements in each stage. I also want to keep track more carefully of the wider reading I do, both related to the particular assignments and on textile subjects generally. Unlike project 1, no specific review questions were included in the course notes. The questions below are based on other student blogs, in particular Claire at Tactual Textiles, because I felt they provide support for a broad review of the project work. Do you feel happy with the work? Overall I am happy with what I have achieved, taking into account my current level of development. I have dabbled in stitching in the past but it has not been a major focus. Do you prefer working with stitch to drawing? Can you begin to see the relationship between the two? There is no simple answer to this. I have not done much of either in the past. I can see that drawing is fundamental to a design development process, and given my desire to progress in my textile work drawing (in various guises) needs to become embedded in my methods. I enjoy practising each (or most!) days and am keen to extend what I do and to increase my fluency and skill. I have an overall preference for various qualities of textiles over paper, so in that sense prefer stitch. However I don’t see stitching as necessarily a major part of my ongoing textile work. I found the process pleasant if sometimes frustrating and slow. I can see the flexibility and ease of creating marks lines and texture in both drawing and stitch. I’d like to think I am open to change and everything is on the table, but at the moment my core interest is weaving. It will be interesting to see how the design process being taught will relate to future weaving projects. My results were mixed. I was pleased with Stage 3 and the effects provided by cretan stitch and some of the straight stitch. In Stage 5 the raised chain band was very successful in suggesting the plant texture. I have blogged extensively about my difficulties and disappointment with the sample in Stage 6. I really like the photo I used in Stage 6 and I hope to do it better justice in a future work. I should have been more selective about the size and complexity of the area used. I like the Stage 3 sample and think it works well as a piece on its own. My Stage 6 piece is not a good interpretation of the source material and does not work on its own. However I have posted a number of ideas on what went wrong and where I could improve in future. I wanted to push out of my comfort zone, and despite not liking the result I’m glad I did. I want to learn from this course and take risks and extend myself. I have a tendency to caution and I want to go on challenging it. I think the samples creating texture with stitch were more successful and I enjoyed doing them. I had too much going on in the final sample and overall it didn’t work. My created yarns were difficult to work with and I didn’t enjoy being so out of my depth. However I think some of the individual elements have promise. Make some comments on individual techniques and sample pieces. Did you experiment enough? Did you feel inhibited in any way? It’s never enough! Looking through the work I have definite preferences for less regimented, more freeform stitching and for layers of stitch. For example when using cretan stitch in Stage 5 I think the layered, multi-coloured area bottom right is the most interesting result. The callistemon area in Stage 5 is another favourite, with a lot of texture and interest. I find it very difficult to work evenly and neatly. When I attempt it (for example the satin stitch at the top of the green Stage 5 sample) my hands and wrists tense and ache. I prefer both the process and the results in more spontaneous work. There are aspects of the exercises I have found challenging and generally these are recorded in my blog entries. It is not precisely an inhibition, but the nature of doing work as part of a course is that one focuses on meeting requirements and must resist chasing after particular ideas. As in the first project I sometimes struggled to understand quite what I was meant to do. It’s an interesting balance, trying to be creative and adventurous but remaining within the constraint of producing finished assignment work. Still, we pretty much all always are working within constraints. I think the two approaches work in tandem. A drawing helps to clarify intention. When I got lost in Stage 6 I turned to drawing to find a way forward. Playing with yarns extends what I have the skill and knowledge to do – plus it’s fun! One sample I really wanted to do was raised chain band on some of my handwoven cloth. I had already chosen some to experiment on, but felt pressured by time and don’t want to hurry it. I’d also like to try stitching while at the loom – on the unwoven warp or on the cloth in process. It’s already there under tension as if in an embroidery frame and perhaps could lead to interesting effects with differential shrinkage in finishing. Another area of interest is stitching on felt. I think there are a lot of possibilities for contrast and play with colour and texture. One thing that’s working quite well so far is my mix of log/note/sketch book(s). This blog is my logbook, but its electronic nature makes it better for some things (eg reflecting) than others (jotting notes while at the sewing machine). The jottings tend to go into an A5 notebook, which also travels around in my bag so gets oddments on current reading, works seen at exhibitions etc. I tend to use A3 paper when at my worktable, sketching or trying to figure how to rescue a sample. A3 was a bit too big to take on holiday, so there’s an A4 folder. The part that’s really working for me is that the A5, A4 and A3 folders are all looseleaf – I use treasury tags (a short piece of string with two metal ends like this |—–| ) to hold the pages together. Which means I can put a mix of papers into each folder, and even better means that every once in a while I can consolidate all the pages of work into one storage folder (as in the photo). It means my final “sketchbook” is a bit of a hybrid but for me easier than having four or more places to check when reviewing progress or searching for something. Hopefully this non-purist but practical approach will work for Pat and the course assessment. The last post detailed one thing that didn’t work for me – my Stage 6 sample. A little time and reflection, plus some valuable input from friends, has helped. A couple of final thoughts – I think I tried to do too much and would have been better selecting a smaller area of the photo; and I confused visual and physical texture. Yesterday at the White Rabbit Gallery I saw a brilliant example of visual texture on a quite flat surface – High Seas by Shi Zhiying. Follow the link, click on the Portfolio tab then on the thumbnail. It can only give an idea of the actual painting, which is 8 metres wide, 2 metres high. It has amazing visual texture, you almost feel seasick, but there is no deep layering of the oil paint. The painting fills your field of vision. Dribbles and blots emphasise the paint but it is still a very realistic image. It’s almost monochrome – perhaps a little blue in the middle distance. The texture, the waves, the depth, is produced by variations of value, of brush strokes, of energy and movement in the marks. On the bus during the week I’ve been reading ahead in the course notes for Assignment 2. Some interesting stuff coming up but what caught me was some exercises separating texture, colour and shape. I think this is really going to help me move forward. as much as it ever will be. It’s not pretty (“breathtakingly awful” and “no redeeming qualities” are in my jotted notes), the process wasn’t pretty, the detritus in my work room isn’t pretty – but “done” sounds very pretty. The yarn wrapping went smoothly. I’ve done lots of wrappings for weaving and it makes sense – expand in direct proportion to wind the warp. Weft and structure as well as sett, skill etc will have a big impact, but the wrapping gives a good general indication. For stitching I’m not so sure – there are hugely more variables. Still the process was pleasant, I used a mix of made-en and bought-en yarns, and I was generally pleased with the result (although the mid-to-dark section looks a bit flat and dull). On the left is the stitched end result – you can click on it for large if you really feel the need, but I’m not recommending it! The original photo is on the right. What went wrong? I started at the top using some of the homemade yarns posted here and just didn’t like the look – colour, texture or shape. I forced forward, then got to the foreground and started piling things on the fabric to build it up. At this point I realised I was panicking and walked away for a while, reminded myself that texture and colour proportions were the point, definitely not reproducing an image and not something in deep 3D. The assignment asked for a sample, not a finished piece of work. What I had was just a pile of stuff plonked roughly in a circle. I pulled out the sketchbook and tried to draw lines and shapes that might balance the stitching a bit, treating it as a textured but flat design. Then I slept on it. This afternoon I did battle again, and declare it enough. What have I learnt? I already knew I have a long way to go with design, and with stitching if I make that part of my ongoing work, but I have been confirmed in that. The areas with tulle and silk tissue laid over the base fabric helped calm things down and give a place for the eye to rest. Couching with a strip of tulle over the “sewn snippets yarn” I made worked quite well. I don’t like working with strips of pantyhose and don’t like the effect I got from it. Almost the last things I did were the stem stitch around the border on the left, to unify and contain things a bit, and the couched bundle of threads (3-step machine zigzagged) that goes diagonally up from right to left and a few other places. I think both helped pull things together at least a little, although really it’s still just an ugly bunch of stuff. Finally, my image editing software (gimp) has a colour value histogram function (which I found after all the palaver on values I went through). On the left is a comparison of the original photo and a photo of the stitching, which I think is a decent match. Next steps are write a review of project 2, write a short reflective commentary on the whole assignment, and package everything up to post to my tutor. That will be my focus the next few evenings after the day job. This stage has a few parts to it: experiment in making my own yarns; select a drawing looking at texture and colour effects/proportion; select yarns and threads and make a wrapping in the same proportion; work a sample. I seem to have got a bit stuck so have decided to push on through, drawing various lines and saying “good enough”. So this post is progress to date and by the end of the weekend I will post the end. Rather than using a drawing, I decided to work from a photo taken during my recent Western Australia trip. 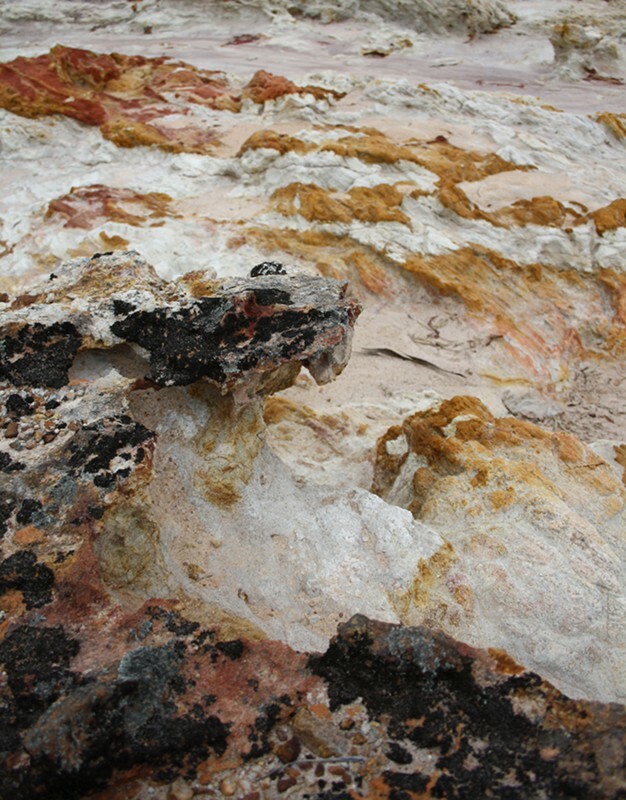 I’d been very conscious while travelling of building up a library of colour and texture photos in three categories – rust, botanical (especially bark) and rocks – and really wanted to start using them. So far I’ve created new sketchbook pages for rust and botanical. Initially I looked for dark and intense colours, but couldn’t find a photo that fit – there was just too much light. Eventually I selected this photo of a salt lake near the town of Lake Grace. There is lots of texture, crunchy and jagged. 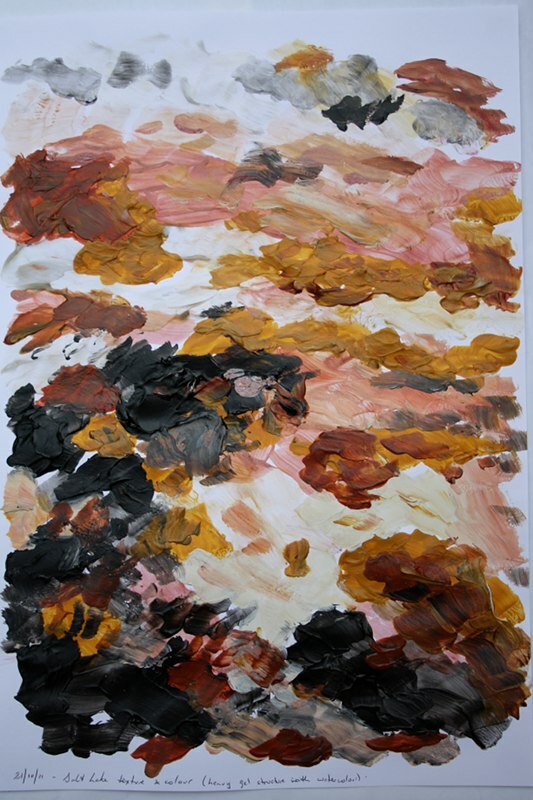 There is also a range of colours, generally earthy (I cropped out the green fields at the top), and values. I thought it could be interesting to develop lots of textured layers with couching, so I planned to use my experimentation in creating yarns to build up a stash of candidates to be couched in the stitch sample. The next step was figuring out what colours were in the photo, to direct the yarn creation. My first attempt using inktense pencils was disappointing but useful – there was much less yellow and orange than I first thought. I was much happier with my second attempt, shown in the thumbnail, which used water colour and a heavy structure gel. Still not satisfied, I tried a computer auto-generated palette and manually picking colours to create a little bubble picture. By this stage I was perhaps losing the plot. 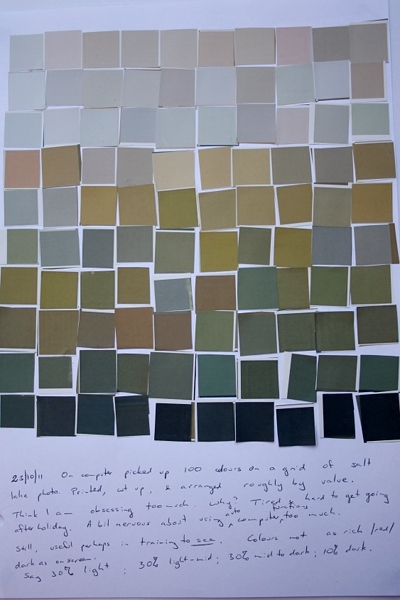 I decided to investigate proportions – by putting a grid of 100 rectangles over the photo, selecting a “representative” colour from each, putting a rectangle of that in a new image, printing it out, cutting it up, rearranging the colours roughly by value, glueing them onto another page. Perhaps time for a bad pun about losing and finding proportion. I eventually decided values were roughly 30% light; 30% light-to-mid; 30% mid-to-dark; 10% dark. I later found some functions in the software (gimp) that assist in this sort of analysis. On one hand I feel I need to trust my eyes to do this; on the other, the exercise was probably good training, and why not use the tools you have available? Draw line. Move on. The next step was experimenting with creating yarns. Given the plan was to sample couching I didn’t have to worry about the practicalities of pulling my creations through fabric. Row 1 – The plastic outer covering of an electrical cable. There’s an interesting ridged texture, but I don’t like the plastic look. Possibly cut into thinner strips it would be more usable. Row 2 – one of the wires in the cable with parts of the plastic coating cut away to expose the wire. I like the bumps and flashes of colour achieved, but sharp ends scratching and catching got old quickly. 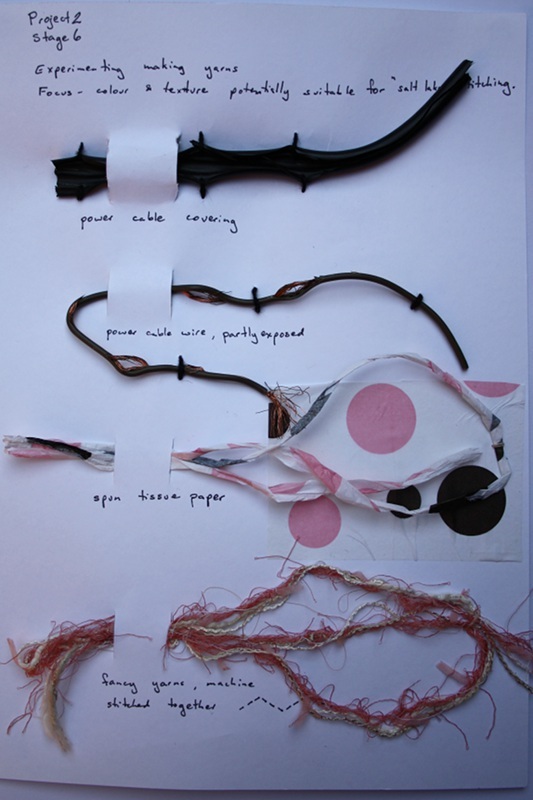 Row 3 – some tissue paper torn into strips then twisted using a spinning wheel. I was thinking of shifu – woven paper – and the work by Wang Lei , knitted “imperial robes” made with yarn spun from Chinese-English dictionaries, that I saw at White Rabbit Gallery earlier this year. Technique-wise I have work to do. For the current purpose I like the crunchiness and angles but the colours didn’t mix up as much as I hoped. Row 3 – A number of fancy yarns stitched together on the machine. I have a beading foot, which helped keep things together and used a three step zigzag which makes the yarns separate in rather a nice, lively way. I was hoping lighter colours would calm down the pink more. Possibilities include overstitching some more (but losing texture) or possibly knocking back the colour by overlaying with an organza while stitching. Photo 2, top to bottom. Row 1 – A bundle of cotolin threads oversewn with (ordinary) zigzag. I was looking at the top part of the salt lake image which looks almost like a light pink stream, and trying to create a lightly textured, lightly coloured yarn. On its own it looks rather bland, but it could work well in the sample. 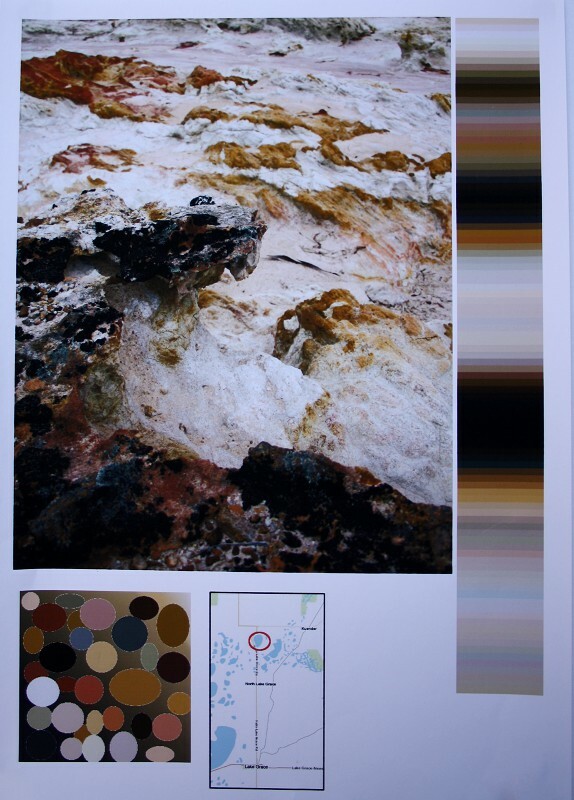 Row 2 – This was based on the bottom part of the salt lake image where there is a lot of colour variation in the rocky texture. 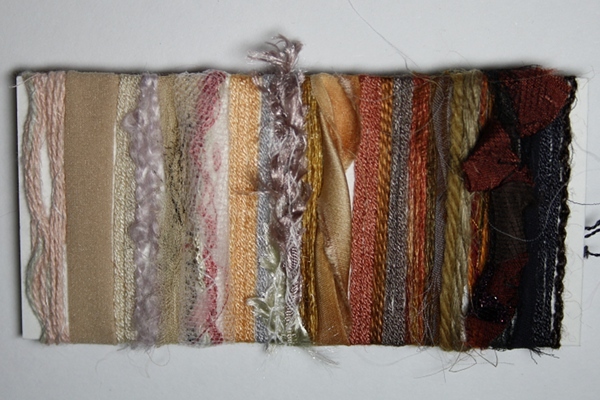 I gathered a pile of snippets and offcuts in the colour range, then machine stitched them onto a strip of tulle. I was thinking of gorilla yarn, where you card a bunch of “stuff” together then spin a lumpy, colourful yarn. I ran out of time to do that and thought this could be a quick substitute. On its own it’s too bitsy, but I think this could work if integrated a bit better while couching, for example by couching with another strip of tulle, or overlaying with layers of tulle or organza before stitching. Row 3 – cut up pantyhose. I tried to add some texture and interest with knots. It would be interesting to combine this with the stitched snippets idea of the previous sample. Row 4 – A braid (12-Z-ridged-spiral) made with cotolin. I wanted to try this even though I thought it would be too formal in appearance for the particular application. My highly variable tension makes it less formal, but still not right for the sample. I got the instructions from Makiko Tada’s Comprehensive Treatise of Braids VI and would like to try mixing it up with the Braid-in-Braid idea, where an earlier braid is carried up the middle, then brought out and wrapped around every once in a while. Perhaps one could use individual yarns rather than a braid inside, and swap in and out colours, or try using textured yarns. I do like the way the colours work in the sample. There were a couple of other little bits, but somehow they missed the photo shoot. Line. Move. Next steps are the yarn wrapping and actual sample. It’s Friday evening and the clock is ticking. 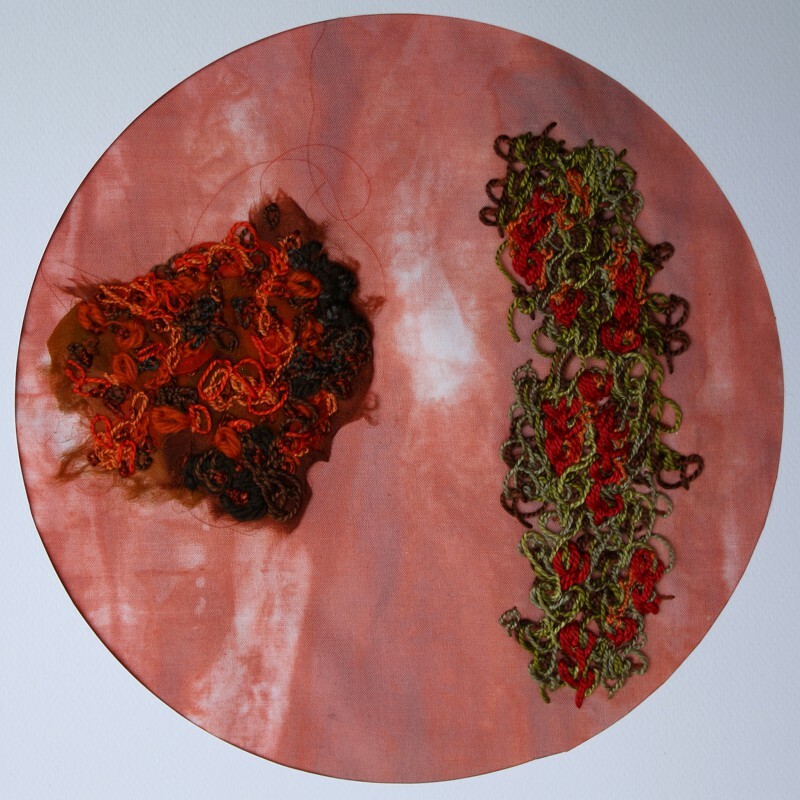 Penny Leaver Green is a new-to-me textile artist, highlighted in a post on the Mr X Stitch blog. 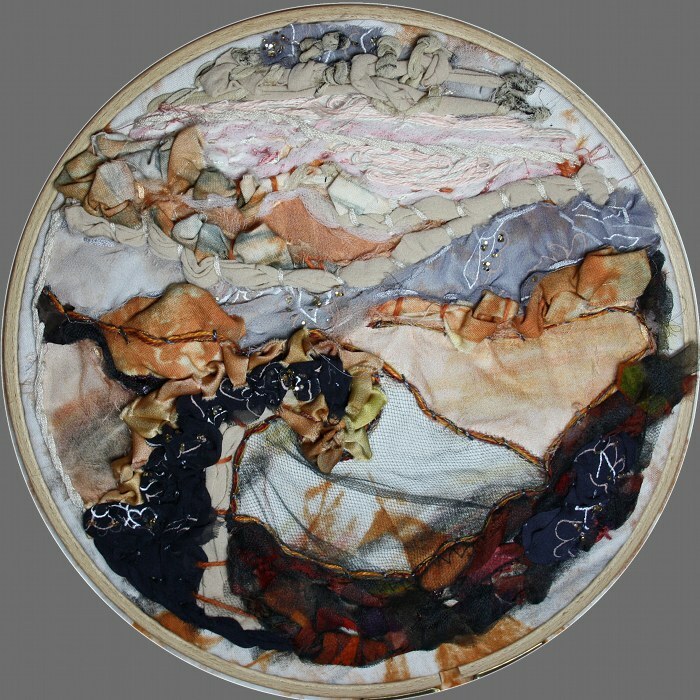 She asks that her images and words not be used without permission, so you need to follow this link to learn more about her approach to using stitch and fabrics to explore ideas and create meaning. I find the images draw me in, I get a sense of space and thoughtful consideration. This doesn’t mean the subject matter is easy, for example recent work explores aspects of the Japanese tsunami – a map, growing sunflowers to absorb radiation, another map of radiation levels. Penny has produced a series of work on button phobia, and seems to use buttons and circles in a lot of her work – in particular an appliqued circle with a cross stitched over, seen in the colour pictures (like tests for colour blindness) and placemarkers on maps. Maps also recur in her work, some made by her, some collected. Another chance find yesterday (it was raining, so I did my lunchtime walk in a bookshop!) was Textiles: The Whole Story by Beverly Gordon. The author herself admits it could seem grandiose to attempt the full story of textiles, their importance today and in history, in myth and ritual, in all cultures, physical, spiritual, emotional… (of course we already know the Ultimate Answer to Life, The Universe and Everything). I’ve only just started reading, but already know this is a wonderful book that will change and deepen my understanding and love of textiles. I like the personal, warm, intimate style of writing – this is someone who loves her subject and wants to share with us all. I like the broad focus and the perspective given, and already feel as if things half-perceived are being put into focus. I find her storytelling engaging, beautifully and relevantly illustrated. I feel like my little hobby is part of an incredibly bigger whole – coming from a maths/science background there’s almost a sense of validation that this isn’t a soft diversion, that textiles are fundamental to human existence (not that I’ve been wanting or needing validation, still…). Even the paper of the book feels nice, a tactile pleasure. 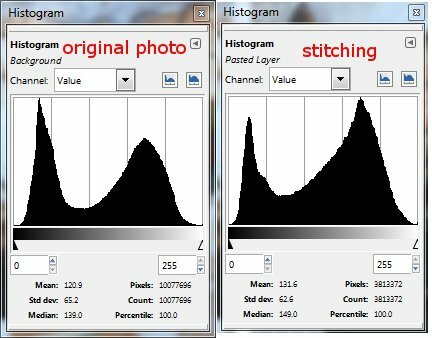 In stage 5 was the suggestion of working a small sample relating some of the stitch texture effects to drawings. I packed a small set of supplies on holiday and found stitching a restful end to the days spent in Perth. I decided to try variations of chain stitch. The section on the left was based on rust. I’d taken a series of photos while we were travellings (a few are on my new Rust sketchbook page), and based on them attempted a couple of small, woeful sketches (here). 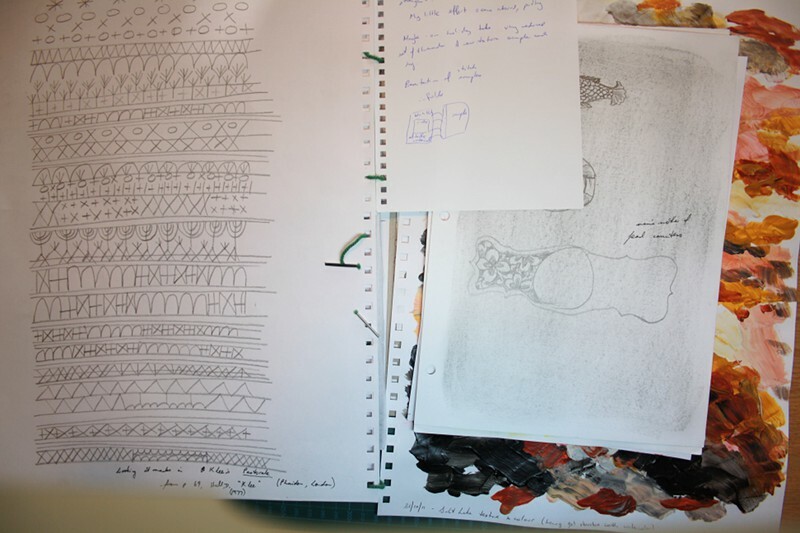 Time to move on to stitch – but I was rather pleased to find myself sketching out a rough plan first. I wanted a layered and crusty effect, so started by scrunching up and overlaying some scraps of orange and brown silk organza. 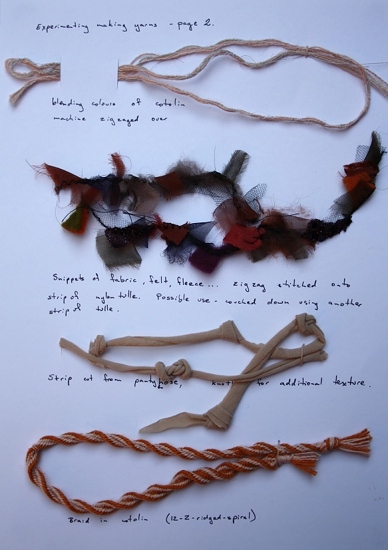 I couched these down with a series of threads of various weights – wool, silk and cotton. There’s chain stitch, detached chain and twisted chain. The stitches are worked over and around each other, trying for an uneven surface and a mix of colour. Some stitches were worked quite loosely, to get a flakey, peeling effect. I don’t think the result looks like rust, although if I explain it people go “Oh, OK – I can see that”. I like the varying density of stitches, sometimes deeply layered, sometimes quite sparse and allowing the organza to show through. I also think chain stitch was a good choice for the spotty appearance common in rust. However I think there is too much orange and also too much shine from some of the threads. I’m not sure how this would work in an actual piece – there’s no focus or real movement, but it’s probably a bit too busy for a background. The sample on the righthand side doesn’t have a specific image source. I was thinking of callistemon (photos on this website) and also wanted to try layers of raised chain band based on an illustration on page 137 of Stitch Magic (Jan Beaney and Jean Littlejohn). The base stitches are in cotolin, the rest is mostly perle cotton and silk. I built up layers of stitch going from browns through various greens, working very loosely and both up and down to get a random, wild effect. The flowers have a base of orange 20/2 silk, then doubled perle cotton using a higher tension than the leaves. I’m happy with the result. The different weights and working of the leaf and flower stitches, combined with the contrasting colours, are in my eyes strongly reminiscent of the plants. I also like the shine and liveliness – like seeing the callistemon on a bright sunny day. I think the least successful part is the transition from the heavy stitching to the background fabric. The overall shape isn’t right. I find the two sections together interesting. I had a very limited set of threads and fabric, kept to one basic stitch, but got quite different effects.